You have the option to go to Lake Titicaca before or after your adventure. We recommend before your adventure so that you do not miss the tour of Lima the last day of the main program. Peru has a superabundance of delights, including vast Lake Titicaca, with its sparkling sapphire waters (60% of the lake lies within Peru). From Cusco, you'll travel to Puno. The following day you will tour the Inca terraces and ruins at scenic Taquile Island and the "floating islands" of the Uros people who build the famous "totora" reed boats. 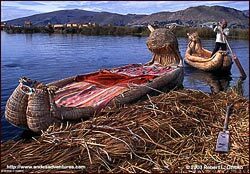 The Uros and other lakeside dwellers depend extensively on the totora reed. It is used to make fishing boats, homes as well as the famous floating islands of reed. Visit the pre-Colombian ruins at Sillustani. In Inca mythology, Manco Capac and Mama 0cllo, children of the Sun, emerged from the depths of Lake Titicaca to found the Inca Empire. With imposing snow-capped peaks along its far shores, the vast blue lake is one of the Andes' most enchanting scenes.